Should the latest threats by the North Koreans be taken seriously or are they all talk and no action? Also, we've seen that the North Koreans have ended their peace pact with the South Koreans in the wake of UN sanctions a few weeks ago. Is this a sign of things to come? There's nothing in The Age about it, so hopefully all's ok. The NK political system relies on patriotism. paranoia, and public panic. They have to have these big war scares every year or two or people start thinking about pots and rice to put in them and housing and education and health and democracy and .... Did somebody just say democracy!!! People mustn't think! Time for another war scare! We have seen this sort of power retention tactic here too (remember the babies overboard?) and in the United States (the post-911 panic; GW Bush's "war of terror", sorry on terror) but the NT kooks in charge make our kooks in charge look almost rational. Ignore it. The whole thing is for NK domestic consumption only. They are not interested in having a war, only in i]nearly[/i] having one. Unless, of course, there is a little accident and one of their the air-punches really lands, in which case the Yanks will wipe them off the face of the planet and no-one will care. Well, no-one that's still alive. The poor workers and peasants of North Korea will care, but they will all be dead. While I agree with all of what Tannin has stated and we have seen all this huff and puff before I do have this worrying feeling that this time it's more serious than ever before. If North Korea were to say act in a similar way when they bombed South Korea's Yeonpyeong Island the results this time will be greatly different. The North's best ballistic missile can barely reach Japan so I presume they intend to attack the West-Coast from a podium off the LA shore. Well, they do threaten to make the latter stages of th finals sometimes. Consider them an outside chance in brazil at best. it worries me. they tore up the agreement they had with Sth Korea which was forged in 1953. 60 years ago this year. And i'm sure the Sth Koreans are worried. Sounds a little more unsettling. Hopefully it is all just an exercise in propaganda on North Korea's part. 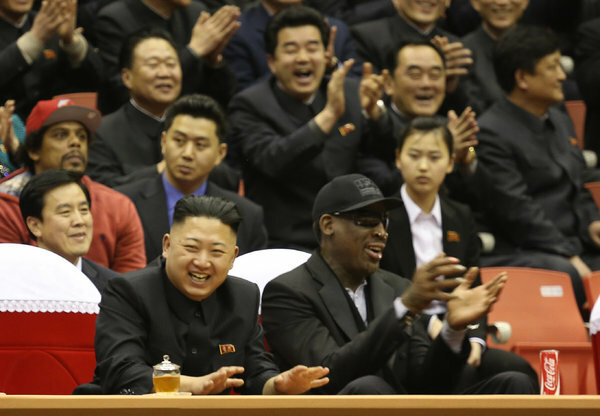 I'm not sure if having a meeting with Dennis Rodman makes him more or less likely to nuke South Korea. Weird yes but totally bonkers? Apparently, Dennis Rodman was the first American that Kim Jong-Un has met! No, South Koreans are not more concerned about this than usual. A new government was elected back in November and took over after the lame duck session at the start of March; shenanigans were expected both before and after, particularly to assert the identity of the new NK leader. Please note the media which reaches your ears in Australia includes a lot of batshit comments by North Korea and the futile parsing thereof, as well as headlines generated by interviews with fundamentalist apocalyptic Christians on street preaching duties in downtown Seoul. Add that to paranoid nutbaggery elicited from whacko conservatives in Japan and the US, and the picture you get is about as accurate as Lance Franklin in a grand final. South Korea, China, the US and Japan are always on alert, hence the overwhelming forces in the region. Yes, anything theoretically could happen, but for the 28th time, the likely risk is not North Korea attacking, but North Korea collapsing, leaving a no-man's land up for grabs between China and SK/US/Japanese forces, as sad as that fact is for the suffering population of NK. In the end the rain comes down, washes clean the streets of a blue sky town. pardon If this is a dumn question, but are you in the north or south? Sorry, TP, that is pretty funny.